Es una de esas, pocas, fotos que estan mencionadas en todos las enciclopedias, catálogos etc. como iconos de la fotografía mundial. Esto lo es hasta tal punto que la misma Wikipedia le dedica un artículo completo. The Steerage is a photograph taken by Alfred Stieglitz in 1907. It has been hailed as one of the greatest photographs of all time because it captures in a single image both a formative document of its time and one of the first works of artistic modernism. "There were men and women and children on the lower deck of the steerage. There was a narrow stairway leading to the upper deck of the steerage, a small deck right on the bow of the steamer. 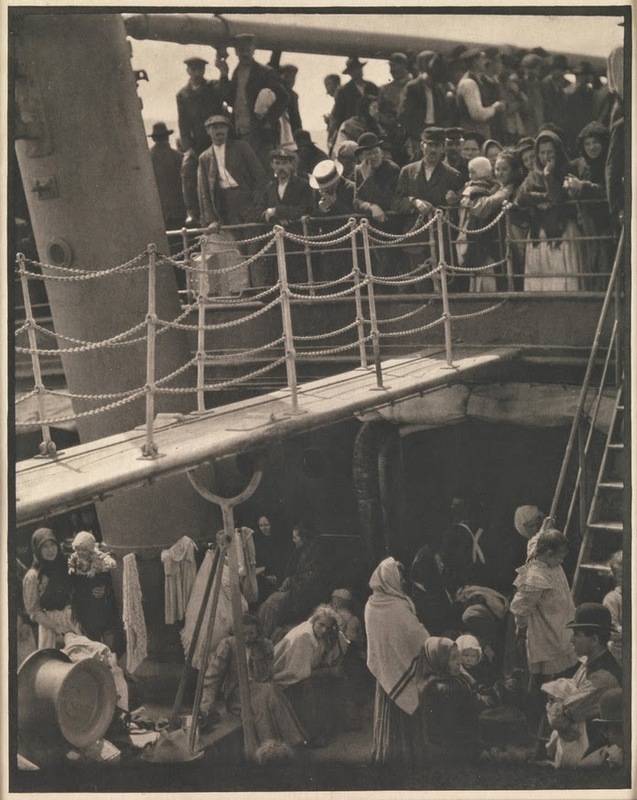 The Steerage began its life as a masterpiece four years after its creation, with Stieglitz's publication of it in a 1911 issue of Camera Work devoted exclusively to his photographs in the "new" style, together with a Cubist drawing by Picasso. Stieglitz loved to recount how the great painter had praised the collagelike dispersal of forms and shifting depths of The Steerage.